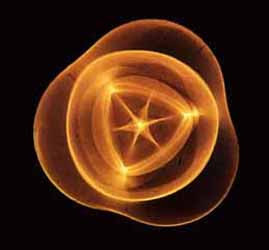 The term Cymatics was coined by Dr. Hans Jenny which is derived from the Greek word 'kyma' meaning 'wave' or 'ta kymatica' meaning 'matters pertaining to waves'. In 1787, the jurist, musician and physicist Ernst Chladni published "Entdeckungen über die Theorie des Klangesor", "Discoveries Concerning the Theory of Music". In this and other pioneering works, Chladni laid the foundations for that discipline within physics that came to be called acoustics, the science of sound. Among Chladni´s successes was finding a way to make visible what sound waves generate. With the help of a violin bow which he drew perpendicularly across the edge of flat plates covered with sand, he produced those patterns and shapes which today go by the term Chladni figures. 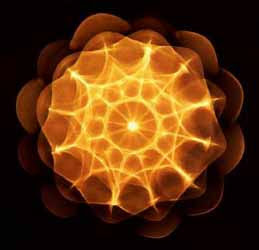 Chladni demonstrated once and for all that sound actually does affect physical matter and that it has the quality of creating geometric patterns. In 1967, the late Hans Jenny, a Swiss doctor, artist, and researcher, published the bilingual book 'Kymatik -Wellen und Schwingungen mit ihrer Struktur und Dynamik' / 'Cymatics - The Structure and Dynamics of Waves and Vibrations'. In this book Jenny, like Chladni two hundred years earlier, showed what happens when one takes various materials like sand, spores, iron filings, water, and viscous substances, and places them on vibrating metal plates and membranes. What then appears are shapes and motion patterns which vary from the nearly perfectly ordered and stationary to those that are turbulently developing, organic, and constantly in motion. When Jenny experimented with fluids of various kinds he produced wave motions, spirals, and wave-like patterns in continuous circulation. In his research with plant spores, he found an enormous variety and complexity, but even so, there was a unity in the shapes and dynamic developments that arose. With the help of iron filings, mercury, viscous liquids, plastic-like substances and gases, he investigated the three-dimensional aspects of the effect of vibration. In his research with the tonoscope, Jenny noticed that when the vowels of the ancient languages of Hebrew and Sanskrit were pronounced, the sand took the shape of the written symbols for these vowels, while our modern languages, on the other hand, did not generate the same result! How is this possible? Did the ancient Hebrews and Indians know this? Is there something to the concept of "sacred language," which both of these are sometimes called? What qualities do these "sacred languages," among which Tibetan, Egyptian and Chinese are often numbered, possess? Do they have the power to influence and transform physical reality, to create things through their inherent power, or, to take a concrete example, through the recitation or singing of sacred texts, to heal a person who has gone "out of tune"? An interesting phenomenon appeared when he took a vibrating plate covered with liquid and tilted it. The liquid did not yield to gravitational influence and run off the vibrating plate but stayed on and went on constructing new shapes as though nothing had happened. If, however, the oscillation was then turned off, the liquid began to run, but if he was really fast and got the vibrations going again, he could get the liquid back in place on the plate. According to Jenny, this was an example of an anti-gravitational effect created by vibrations. What Hans Jenny pointed out is the resemblance between the shapes and patterns we see around us in physical reality and the shapes and patterns he generated in his investigations. Jenny was convinced that biological evolution was a result of vibrations, and that their nature determined the ultimate outcome. He speculated that every cell had its own frequency and that a number of cells with the same frequency created a new frequency which was in harmony with the original, which in its turn possibly formed an organ that also created a new frequency in harmony with the two preceding ones. Jenny was saying that the key to understanding how we can heal the body with the help of tones lies in our understanding of how different frequencies influence genes, cells and various structures in the body. Thank you very much for sharing, very useful information! !